Known the world over as one of the greatest guitar players ever, Zakk Wylde relies on his EMG 81/85 signature humbucker set for his aggressive tone and sustain. This classic setup comes complete with long shaft volume and tone controls for installation in Zakk’s beloved Les Paul or similar styled guitars. I love this Set !! Expecially the 85 that i put on my Sg bridge and on my Les Studio bridge who throws a big fat sound! They give me the possibility to play different genres. The 81 stands very well in the neck for both of guitars! On my flyin’ bloody V, i’ve installed the H2 passive instead:) they paint a Vintage sound as good as my V wants!! Anyway i’ll always play with these marvellous picks with no regrets and wanna thank EMG’s FAMILY!! 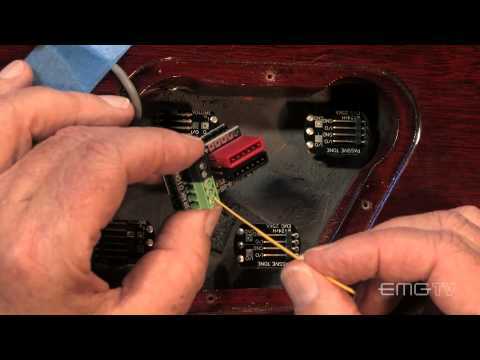 I installed the ZW set into my epiphone LP "Perditus" and I was really pleased by the ease of install. Every part of the set is of high quality - even the packaging. What matters the most for me is the sound and feel. I love the combination of ceramic magnets in the bridge and alnico magnets in the neck position and I couldn't be more satisfied by the output and dynamics the EMG's offer. Plenty of attack for my rhythm playing and lead tones from soothing warmth to burning agony.. I'm in love. Even though I had to put two 9V batteries in, for it to sound like St.Zakk, it sounds extrordinariylyliese amazing!!!! 10/10 Would definetley recommend!!! I bought a 99 lpg classic used, it sounded ok. Never owned an lpg before and never messed with electronics. However it started to sound bad weak and buzzy one day. so I thought I'd look inside, even though I didn't know anything about it. Inside even I could tell it was a mess, whoever worked on it had solder everywhere and wires not attached. I didn't have a lot of money to spend on repair, so I looked for another way and come across the Zakk Wylde set. I watched the video a few times and decided to give it a try. I remembered starting this process, thinking if I screw up, my guitar would be wall art for a long time. I was nervous, with every wire removed I would grind my teeth. I just followed the video step by step. then the moment of truth arrived, I plugged her in, cranked her up and then the glorious sound came out. I was astounded ! it was magnificent ! the strings ring clear and true, that non grounded buzzing sound gone. It was like the sun popping up at midnight. I can barely set here typing because I want to play. However, I am so impressed with these pickups and how easy it was to install them, that I am compelled to do a review. I rarely ever do reviews unless I am incredibly disappointed or pleased. EMG has hit this outta the park. I intend on buying the solderless 3 way switch to complete the set. Now I wont be worried about buying guitars that need wiring work done. So I highly recommend this, if you wanna make your guitar sound brand new, without having to spend a lot of money. Being able to switch EMG pick ups for different sounds and styles with no solder is icing on the cake ! Bravo EMG wish I knew about this sooner. I've been using these pickups for a long time. As I have a collection of about 20 guitars, for a while, I attempted to try passive pickups. I tried Dimarzio's, Gibson's and Seymour Duncan's and I came back in full circle to the EMG 81/85 Combination ZW Set in combination with the SPC Tone Control. Back in the day, you had to solder these. Today, 30 years later, they are so easy to install thanks to a hub and the soldering is very minimum. I'm very glad that despite that the guitar industry has gone down the drain as far as quality, EMG to this point is still selling the same quality they had back in the day. tone! The EMG 81 has a killer bottom and is perfect for Heavy Metal. The 85 is great for solos and it has an awesome creamy tone. Quite simply, is the best investment any one can make on their guitars if they are serious about sound and tone. Just installed a ZW set to replace the stock HZ's in my Epiphone ZW Camo custom, and it was well worth the investment. The difference is night and day, and my guitar is a monster now. Thank you! This set came factory in my Dean DIME Razorback V255 Explosion. I was so impressed with them, I ordered a set to put in my Jackson Kelly XL Professional. Well made, worth every penny... these will give you the old school Thrash / Hard Rock tone you're looking for.